When will climate feedbacks fully function? Not for millennia | Watts Up With That? El Comendador is quite right to press his excellent question, and I must begin by apologizing that I was not able to answer it sooner. I must also issue an Equation Alert. We’re going to have to review – in the simplest fashion – the fundamental equation of climate sensitivity, and then go deep into the IPCC’s documents to work out what they have hidden by their now-traditional device of not making it explicit what their projections entail. So, hold on to your hats. Here goes. Climate sensitivity: The global warming ΔTt to be expected in response to a given proportionate increase in CO2 concentration over a specified term of years t is for present purposes sufficiently described by the simplified climate-sensitivity relation (1), where ΔTt, denominated in Kelvin or Celsius degrees, is the product of three quantities: the reciprocal of the fraction q of total anthropogenic forcing that is driven by CO2; a time-dependent climate-sensitivity parameter λt, which is itself the product of the instantaneous or Planck sensitivity parameter λ0 and a time-dependent temperature-feedback gain factor Gt; and the CO2 radiative forcing ΔFt. Annex B provides a more detailed discussion of (1), and of the uncertainties to which it gives rise. Global warming ΔTt: On business as usual, without mitigation, global warming of 2.8 K from 2000-2100 is the mid-range projection in IPCC (2007, table SPM.3). Since the Earth has warmed at a rate well below those projected in all five IPCC Assessment Reports and there has been no global warming since 1996 (RSS, 2014), 2.8 K 21st-century warming will be taken as close to the upper bound. CO2 concentration: On business as usual, unmitigated CO2 concentration over the 21st century will attain the annual values (in μatm) in Table 1, derived from the mid-range estimates in IPCC (2007). where (Ct/C0) is a proportionate change in CO2 concentration over t years, with C0 the unperturbed value. Myhre et al. (1998), followed by IPCC (2001), give the coefficient k as 5.35, so that, for example, the CO2 forcing that arises from doubled concentration is 5.35 ln 2, or 3.708 W m–2. Planck parameter λ0: Immediately after a perturbation by an external radiative forcing such as anthropogenically-increased CO2 concentration, the climate sensitivity parameter by which the forcing is multiplied to yield the global temperature response will take its instantaneous or Planck value λ0 = 0.31 K W–1 m2 (expressed reciprocally as 3.2 W m–2 K–1 in IPCC, 2007, p. 361 fn.). The sensitivity parameter λn: To allow for the incremental operation of temperature feedbacks, considered by the IPCC to be strongly net-positive, λn is projected to increase over time. The IPCC implicitly takes λn as rising from the instantaneous value λ0 = 0.31 K W–1 m2 via the centennial value λ100 = 0.44 K W–1 m2 and the bicentennial value λ200 = 0.50 K W–1 m2 (derived in Table 2) to the equilibrium value λ∞ = 0.50 K W–1 m2. The equilibrium value is not attained for 1000-3000 years (Solomon et al., 2009). Centennial parameter λ100: This and longer-term values of λn allow for longer-term mitigation benefit-cost appraisals. The IPCC projects CO2 concentration of 713 μatm in 2100 against 368 μatm in 2000, and a mid-range estimate of 2.8 K warming by 2100, of which 0.6 K is pre-committed (IPCC, 2007, table SPM.3), leaving 2.2 K of new warming, of which 70% (derived in Table 2), or 1.54 K, is CO2-driven. Therefore, the IPCC’s implicit centennial climate sensitivity parameter λ100 is 1.54 K divided by 5.35 ln(713/368) W m–2, or 0.44 K W–1 m2, representing an increase of 0.13 K W–1 m2 over a century against the Planck value λ0 = 0.31 K W–1 m2. This value is half of the equilibrium value λ∞, derived below. Bicentennial parameter λ200: Examination of the six SRES emissions scenarios for 1900-2100 (Table 2) demonstrates the IPCC’s implicit bicentennial sensitivity parameter λ200 to be 0.50 K W–1 m2 on each scenario. Equilibrium parameter λ∞: Dividing the IPCC’s 3.26 K central estimate of climate sensitivity to a CO2 doubling (IPCC, 2007, p. 798, box 10.2) by the 3.71 W m–2 radiative forcing in response to a CO2 doubling gives the implicit equilibrium sensitivity parameter λ∞ = 0.88 K W–1 m2, attained after 1000-3000 years. CO2 fraction: In Table 2, the fraction q = 0.7 of total anthropogenic forcing attributable to CO2 emissions is derived from each of the six SRES standard emissions scenarios. Plotting the four values λ0 = 0.31 K W–1 m2, λ100 = 0.44 K W–1 m2, λ∞ = 0.50 K W–1 m2, and λ∞ = 0.88 K W–1 m2, produces curve A in Fig. 1. As the inset panel A shows, the temperature rises quite sharply in the first century or two. Figure 1. Two equally plausible evolutions of the climate-sensitivity parameter λn. Version A is implicit in IPCC (2007). However, version B, an epidemic curve, is equally plausible. Now, the various values of the climate-sensitivity parameter arise over time because temperature feedbacks do not take effect instantaneously, particularly in the IPCC’s very high-sensitivity regime. They unfold on timescales of centuries to millennia. One example of a millennial-scale feedback is the melting of the land-based ice in Greenland, which the IPCC says will only happen if global temperatures remain 2 Cº higher than today for several millennia. And even this is probably an exaggeration. Most of you are too young to remember, but 8000 years ago the mean temperature at the summit of the Greenland plateau was 2.5 Cº higher than it is today (Fig. 2), but the ice there did not melt. So the most one might expect, even after several millennia, is some further loss of ice around the coastal fringes of Greenland. In passing, there is a characteristically hysterical recent piece (in The Guardian, inevitably) by the accident-prone Australian professional bed-wetter Graham Redfearn, saying that from 2002-2011 some 260 billion tons of ice a year has melted from Greenland. Oo-er! Even if that were the case, sea level would have risen by just 0.7 mm a year, or little more than a quarter of an inch over the decade. Figure 2. 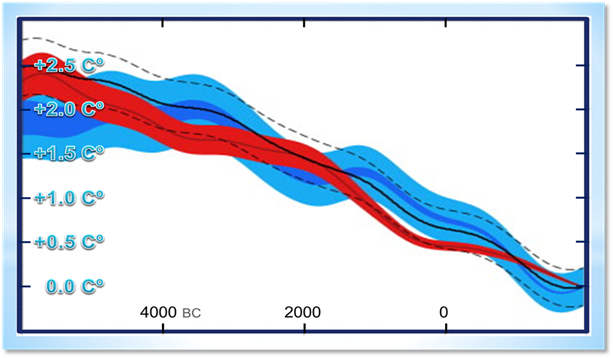 Reconstructed temperatures at the summit of the Greenland ice cap, 6000 BC to date. For reasons such as this, it is no less plausible that feedbacks will come into play slowly to start with, as in inset panel B, than that they will act near-instantaneously in the first century or two, as in the IPCC’s implicit regime (Fig. 1, inset panel A). The literature is pointing ever more clearly towards only the smallest net-positive feedbacks even at equilibrium. In that event, the global warming from a doubling of Co2 concentration will not much exceed 1 Cº, and that will come about within a century or two rather than several millennia. But even on the IPCC’s high-sensitivity central case, after 100-200 years the warming in response to a CO2 doubling would not have reached much more than 1.5 Cº, because the feedbacks under a high-sensitivity regime take longer to come into full effect. Under the IPCC’s imagined regime, of course, the warming would continue to increase all the way to equilibrium, though at a slower rate than in the first couple of centuries. To be fair, one should also bear in mind that CO2 concentration on business as usual will continue to rise even beyond the doubling from the pre-industrial 280 μatm to 560 μatm in around 2080. However, CO2 concentration would have to double again, from 560 to 1120 μatm, to have the same warming effect as that of the previous doubling. Finally, it is worth reiterating that there is no, repeat no, consensus in the scientific literature in support of the IPCC’s assertion that recent warming is mostly manmade. Legates et al. (2013) established that only 0.3% of abstracts of 11,944 climate science papers published in the 21 years 1991-2011 explicitly stated that we are responsible for more than half of the 0.69 Cº global warming since we began to have a theoretically-detectable effect on global temperature in 1950. Suppose that 0.33 Cº – just under half of the observed 0.69 Cº – was our contribution to global warming since 1950. Suppose also that CO2 concentration in that year was 305 ppmv and is now 398 ppmv. Then the radiative forcing from CO2 that contributed to that warming was 5.35 ln(398/305) = 1.42 Watts per square meter. Assume that the IPCC’s central estimate of 713 ppmv CO2 by 2100 (Table 1) is accurate. Assume also that the CO2 forcing from now to 2100 will be 5.35 ln(713/398), or 3.12 W m–2. Assuming that the 0.7 ratio of CO2 forcing to that from other greenhouse gases (derived in Table 2) will remain broadly constant, and assuming that by 2100 temperature feedbacks will have exercised 0.44/0.31 of the warming effect seen to date, the manmade warming to be expected by 2100 on the basis of the 0.33 Cº warming since 1950 will be 3.12/1.42 x 0.33 x 0.44/0.31 = 1 Cº. Broadly speaking, the IPCC expects this century’s warming to be equivalent to that from a doubling of CO2 concentration. In that event, 1 Cº is indeed all the warming we should expect from a CO2 doubling. And is that going to be a problem? Yes. Even the now redundant govn’t climate expert, Flannery, stated as much in 2011. “temperature feedbacks… unfold on timescales of centuries to millennia”. Hansen calls them ‘fast’ and ‘slow’ feedbacks which, from memory, take place on time scales from the immediate to the order of decades to centuries, rather than millennia. But I’m not sure anyone really knows the timescales involved, they are just guesses, because nobody knows 1) how strong both the fast and slow feedbacks are, and 2) nor what relative proportion each is in the overall estimate of climate sensitivity 3) what are the strengths and timescales of any negative feedbacks on both the slow and fast feedbacks. One thing the IPCC has assumed though, is that the immediate effect -the fast feedback-is relatively high, as in their explanation for warming in the late 20th century, which if wrong, makes the other parameters even more questionable. If people really knew all these doubts, the whole ‘science is settled’ nonsense would evaporate. That ‘climate sensitivity’ can be meaningfully calculated is something that even skeptics seem to accept as true. I see Ward responds in his usual way by attempting to denigrate his opponent and making no attempt to answer Tol’s complaint. Ward really is a disgusting creature. IPCC AR3 mentions that equilibrium climate sensitivity (ECS) takes thousands of years to attain. But in subsequent assessment reports they conveniently forget to state it. The uncertainty in aerosol forcing is – 2.5 W/m^2. That’s enough to cancel the CO2 forcing of 1.66 W/m^2 since pre-industrial era. It seems aerosols have greater impact on climate than CO2. BTW Lindzen and Spencer have independent satellite studies showing strong negative feedback of 6 W/m^2/K. This means TCR could be < 1 C for doubling of CO2. I am eager to learn about experiments that confirm calculations of ‘radiative forcing’ . Is there a reference to such experiments, please? The fact is that ‘climate change’ as we observe it since LIA can be explained much better by ‘natural’ phenomenas, like change of solar activity or AMO/PDO; no AGW required. So I think the discussion here is as important as the question how many angles can dance on a pinpoint. More important is the question how many people more can be fed by CO2 in atmosphere, since doubling of CO2 and increased temperature would increase plant growth by a factor of two or more. 0.69 Cº since 1950 mostly ’caused’ by man. So the warming between the end of the Little Ice Age to 1949 was mostly natural. Why are we all in a panic? 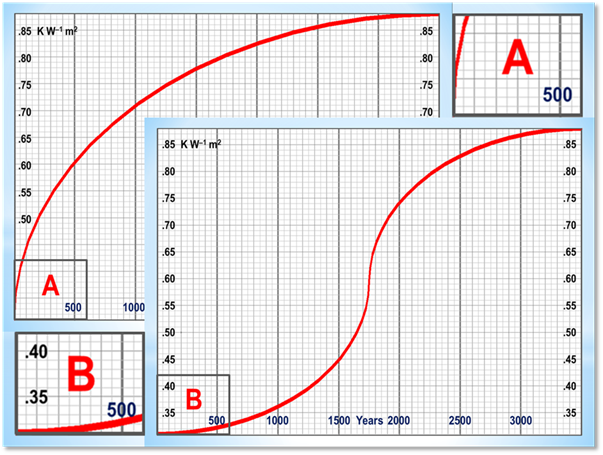 Does anyone have a graph that takes out the human ‘caused‘ component since the end of the Little Ice Age? maybe someone can propose to recreate mann’s study [if its science it should be repeatable right?] and see if they come up with the same conclusion? probably could fund it thro kickstarter or somewhere? I see others have looked at the tree rings and come up with different views. Before it gets decently warm here. Sir David King (ex UK Gov Chief Scientific Advisor) and now William Hagues permanent Special Representative for Climate Change appeared yesterday at the HoC Energy and Climate Change Committee. King said that current installation rate of coal fired power stations up until 2017 does not allow the UN temperature target of staying below 2 deg C to be met. Thats a 1.8% increase of CO2 pa he said. I think there are some really super accurate instrumentation somewhere here? Going at 1.8% pa rise hits the 2 deg UN target at 2043 (IPCC calculation) King said. That does not appear to fit with Lord Monktons calculations above. King states this rise in temp and/or emissions is exponential and is I suspect to many very alarming. Include all his Scientific Advisor agents embedded in Whitehall and British embassies and I am sure his view is going to override anything that Lord Monkon might present and indeed Peter Lilly who thought King lived in a dream world. If any Warmist here wants to use a scary MODEL’S output as evidence for future danger then here is a model. Do you have any confidence in this model? I don’t. P. B. Holden et. al. Using output from a 671-member ensemble of transient GENIE simulations, we build an emulator of the change in atmospheric CO2 concentration change since the preindustrial period. We use this emulator to sample the 28-dimensional input parameter space. A Bayesian calibration of the emulator output suggests that the increase in gross primary productivity (GPP) in response to a doubling of CO2 from preindustrial values is very likely (90% confidence) to exceed 20%, with a most likely value of 40–60%. It is important to note that we do not represent all of the possible contributing mechanisms to the terrestrial sink. The missing processes are subsumed into our calibration of CO2 fertilisation, which therefore represents the combined effect of CO2 fertilisation and additional missing processes. The uninterestingly hemionymous “Martin A” says that “even skeptics accept” that climate sensitivity can be meaningfully calculated. No: we accept that if we try to determine it we may perhaps be able to constrain it somewhat. My own attempts published in the literature suggest that 1.5 K per CO2 doubling may prove to be nearer an upper than a lower bound, but the uncertainties are so great that the best one can say is that the evidence for the proposition that on business as usual a warming substantial enough to do more harm than good will occur is, at present, wholly insufficient. “Martin A” also asks about the experiments that have assisted the line-by-line modelers in determining the logarithmicity of the CO2 forcing equation. Well, of course, in order to determine the line-by-line spectral characteristics of an atmosphere influenced by changes in the concentration of CO2 and other greenhouse gases it is necessary to determine by laboratory measurement the peak wavelengths at which radiation will interact with molecules of each greenhouse gas, and it is also necessary to measure from space the changes in emission of radiation from the Earth’s surface as greenhouse-gas concentrations change. The latter experiments are performed by the Earth Radiation Budget Experiment and by the Clouds and the Earth’s Radiation Experiment Satellite. David Johnson mentions the unspeakable Bob Ward, a paid propagandist of the worst kind. I once appeared on a radio programme with him and he brought with him a paper that had recently been published. I had read the paper and was startled when he fundamentally misstated its conclusions. When I reached across the studio table to pick up the paper and remind myself of its contents, he snatched it away. “Dr Strangelove” mentions the uncertainty in the aerosol forcing claimed by the IPCC, which it uses as a fudge-factor to justify the failure of the planet to warm as ordered. Murphy et al. (2009) show a graph that extinguishes the entire positive CO2 forcing by assuming that the negative aerosol forcing exactly offsets it. It is only by dodges of this transparent kind that the usual suspects can attempt to maintain that global temperature is highly sensitive to changes in CO2 concentration. “Kowalk” and “Twobob” have both rightly mentioned CO2 fertilization as an enormous benefit. Both crop yields and the net primary productivity of plants – i.e. the net global accumulation of tree and plant biomass – have already increased significantly thanks to CO2 fertilization, and the latter change has been observed by satellites. Somehow the IPCC does not make as much of this and other benefits of more CO2 and warmer weather as it should. The aim of this latest manoeuvre is to postpone the day of reckoning, when the lack of any dangerous rise in temperature becomes evident to even the most gullible or dull believers of CAGW. The risk is that a postponement of centuries means that most normal people realize that the thing is a wobbly jelly of a theory that lacks substance and, on balance can be safely ignored. Their hope is to claim the theory has not been disproved and therefore the money will keep flowing. All process engineers like me, around the World, take one look at the radiative physics used by the IPCC and say ‘How could they have been so stupid?’. It’s because they have confused a Radiation Field with a net IR energy flux. The ‘Forcing’ argument is totally wrong. In reality, the surface RF and the atmospheric RF combine vectorally (on average taking account of thermal incoherence) to give the net IR flux. For equal temperatures, there is no net surface IR flux in the self-absorbed GHG bands. Therefore, ‘logarithmic CO2 IR absorption’ does not exist; Radiative Physics 101. Sorry to be so abrupt, but someone has to tell the Meteorologists and Climate Alchemists that there ain’t no such thing as ‘back radiation’ aka ‘forcing’ as a real energy flux : it’s the potential flux to a sink at absolute zero! Increase the RF and net surface IR is reduced. In the absence of anything else, the surface temperature has to rise to give more evapo-transpiration and/or convection. However, other processes reduce this temperature rise to near zero; there ain’t no problem for present atmospheric mass! Please explain that assertion which seems to make no sense. “Equal temperatures” of what? And why do you think they matter. A photon does not ‘know’ the temperature of an object with which it interacts, and an individual CO2 molecule has no temperature. Explanation of your strange assertions would be appreciated. Also the recent UK budget statement suggested that not paying your BBC licence fee could become a civil rather than a criminal offence. The BBC are none too pleased as it could lead to a considerable loss of income. The last sentence of the article is cut off (assuming it’s the last sentence of the article and that nothing else follows it that is). Maybe it’s just missing a question mark? Yawn. Where’s the evidence that CO2 has ever effected climate? What if there can be no change in temperature but instead a change in the atmospheric circulation ? An application of the Gas Laws would suggest that to be the most likely scenario and it would be entirely consistent with the various propositions that global temperatures are somehow thermostatically constrained. One would have zero thermal sensitivity for the system as a whole but a shift in the climate zones for regional variations instead. Should we not be looking at the scale of the anthropogenic shifts in climate zones as compared to natural such shifts rather than focusing on temperature alone ? With regard to so called ‘radiative forcing’ it seems to me that net radiative fluxes within any atmosphere will always net out to zero as a result of the Gas Laws. The slope of the adiabatic lapse rate appears to define the positions in the atmospheric vertical column where UWIR and DWIR balance out. At any given moment there are as many molecules out of position above the lapse rate slope as there are out of position below it so any radiative imbalances in those molecules net out to zero too. If any overall radiative imbalance does arise then convection simply changes the overall air circulation to negate the imbalance. That appears to fit with both observations and well known laws of physics both as regards radiative and non radiative methods of energy transfer. The problem with the purely radiative approach is that it appears to regard convection as having a net cooling effect and so has to introduce the concept of net DWIR. In practice, the adiabatic portion of convection (most of it) is thermally neutral at the surface because energy removed from the surface during uplift is returned to the surface on descent. Has radiative theory overlooked the process of adiabatic warming on the descent ? At any given moment 50% of the atmosphere is rising and 50% is descending as demonstrated by our climate zones with their regions of rising air in low pressure cells and descending air under high pressure cells. I am sorry. I am not impressed with all these estimations and calculations. The fact remains that no-one, and I mean no-one, has actually measured a CO2 signal in any modern temperature/time graph. To me this means that there is a strong indication that the climate sensitivity for a doubling of CO2 from recent levels is 0.0 C to one place of decimals or two significant figures. Hi Richard: Consider two in-phase opposing monochromatic plane waves of equal amplitude. The average Poynting Vector, the ‘Irradiance’, is in W/m^2. They combine vectorally to zero. A Radiation Field is the integral of all PVs. The Earth’s surface RF is near black body. All self-absorbed GHG emission bands appear at the surface at black body level. For equal surface and atmosphere temperature, net Irradiance is zero in these bands. Because of thermal incoherence, the real signal swings between +/- 4x nominal mean Irradiance at each band, averaging zero. Hence net real IR from the Earth’s surface to the atmosphere is solely in the atmospheric window and non self-absorbed bands, mostly H2O; the mean net Irradiance for these bands is the difference of incident mean irradiance. For 16 deg C, 238.5 W/m^2 OLR, the integral of the total, the net RF, is ~160 W/m^2 split 1:2 in non self-absorbed GHG bands and the atmospheric window. In practice, the surface vibrational energy that can be lost is also supplied to adsorbed gas molecules, convection, to vapourise water molecules, evapo-transpiration, and as net IR energy. The operational emissivity of the latter is about 0.16, a sixth of a black body. This comes from the 0.4 fractional IR compared with the total 160 W/m^2 average surface heat loss, divided by the 396 W/m^2, the black body RF for 16 deg C in the 2009 Trenberth Energy Budget. I hope this master-class in real Radiative Physics is OK! Notes: ‘Back Radiation’ gives a Perpetual Motion Machine of the 2nd Kind’. Offsetting 2/3 rds of this extra energy by applying Kirchhoff’s Law of Radiation at ToA in not allowed because the atmosphere is semi-transparent. The residual extra energy after the imaginary water evaporation which gives ‘positive feedback’ is offset by using ~2x real low level cloud optical depth in hind-casting. This, the final, very clever part of the scam, was only discovered recently. The first time lambda(infinity) is mentioned (before Table 2) it has a value of 0.5, identical to that for lambda at 200 years. I assume this is a typo as later it is given as a larger number? I’m wondering how these calculations and estimates account for co2 uptake by the oceans. We can calculate with certainty the amount of co2 a certain quantity of ocean can absorb. Even assuming the oceans have an unmeasured or unmeasurable absorption rate sufficient to maintain a certain range of temperature, there is still the affect that the additional co2 would have on marine organisms. Obviously this is not solely purview of climatologists. Is it not so that there have been many periods in the ” climate history” of earth where CO2 levels were higher than today, at the SAME TIME that the climate was much colder than today? If this is so, than CO2 levels in the atmosphere CANNOT BE the cause of climate changes, and other factors – as yet not understood or even known – are the mechanisms that drive climate. If you cannot explain the historical climate, then you cannot presume to predict the climate. co2 – the flow of energy around co2 carries on and upwards, it’s effect would be like tiny pebbles in a stream, there might be some slight disturbance but nothing to effect upstream. “while low clouds (such as stratus) cause net cooling…. I would imagine co2, at least to the level of the clouds, has the same energy close to that of the surface and as such radiates the same energy as the surface did before co2 was there. Is that synonymous with half-baked, as in “modern climate science” or half-pregnant, as in “no cigar”? reveals Carbon Dioxide in Earth’s atmosphere. WIth all the upward flow of energy around co2 it really makes me wonder how there is any effect, the amount of delay before re-emission would determines how much heat is held within the atmosphere and does anyone know how long the delay is- micro seconds, but co2 on release of its energy surely would not cause any warming, it would just join the already massive upward flow of energy. if there was any downward emission then surely the lower co2 would just absorb that and then release it, so that would seem like madness , a slow step by step of downward energy – perpetual motion? up it goes, whoa.. now it is coming downwards, yea sure!!! Aren’t all of these CO2 emissions over the next 50 years based on the projection that we have enough oil to keep burning it in ever increasing amounts? But doesn’t Peak Oil basically mean we are on a bell curve and oil emissions are due to start falling? Which is it? Global Warming or Peak Oil? Because if oil supply is peaking and heading down the bell curve, then that certainly implodes the bulk of the Global Warming models. In answer to the concisely pseudonymous “pwl”, there should be a question mark followed by the word “No.” at the end of the piece. Not sure where they went. Bill W rightly spots a typo. The IPCC’s implicit central estimate of the equilibrium value of the climate sensitivity parameter should be 0.88 Kelvin per Watt per square meter, not 0.5, which is the implicit bicentennial value. I am sure Anthony will kindly fix these typos. oh and at night time I throw the coin away, the bank of energy closed. my bank of energy closed from lack of funds. One or two commenters seem to be straying in the direction of dragon-slayer territory. Dr Burns asks for the evidence that CO2 has ever affected climate. He will find it valuable to read any elementary textbook of atmospheric physics, or visit any forest, where the timber is made of carbon from the CO2 that was once in the air, or visit any limestone building, or tap a wall made of gypsum. Well, the evidence of the impact of CO2 on our climate is all around us. Mr Cripwell says he thinks the climate sensitivity to a doubling of CO2 is nil. That is self-evidently the case in the short term, for there has been no global warming to speak of for up to a quarter of a century, notwithstanding record increases in CO2 concentration. However, all other things being equal, one would expect some warming from a doubling of CO2 concentration – but probably not very much. Mr Cripwell is quite right not to be impressed with all these calculations. I shouldn’t have had to do them. The IPCC should have been explicit about the fraction of anthropogenic warming attributable to CO2, and about the evolutionary profile of temperature feedbacks, and about the centennial, bicentennial, and equilibrium values of the climate sensitivity parameter. But it has been calculatedly vague, in the vain hope that no one will do what I did by back-engineering its math to find these values, which, now that one can see them, are manifestly absurd. RMF asks how these calculations and estimates account for CO2 uptake by the oceans. They don’t. They are based on the IPCC’s mid-range estimates of the rate of net CO2 concentration growth in the atmosphere. But the oceans already contain 70 times as much CO2 as the atmosphere, so even if all the CO2 in the air ended up in the oceans it would not make much difference to them. Mr Tyler asks whether there were earlier periods when CO2 concentrations were higher than today and the weather was colder. The best example of many is the Neorproterozoic era, 750 million years ago, when I was young. At that time there was at least 30% CO2 in the atmosphere, compared with 0.04% today, and yet glaciers came and went, at the equator, twice. It is fascinating watching true-believing paleoclimatologists trying to explain that one away. They usually do it by saying that the CO2 concentration must have been much more variable than it was. But we know it was at least 30%, for otherwise the dolomitic limestones could not have precipitated out of the oceans. Very confusing. Is this saying that we might still be doomed, but not quite yet? The certainty on the human causation in the IPCC report is simply a necessary statement to justify the supposedly necessary adaptations by humans and changes in political governance models. Those are the real ends because of the social and political power involved. It also justifies the attached changes in 21st century education globally that the UN is pushing. They have said that repeatedly. If we go back to the mid-90s to the UN’s Management of Social Transformations push the UN admits how specious all this modelling is, especially when human systems are involved. Yet human systems are the whole point because the whole purpose of all the mentions of ‘science’ is to justify new global decisionmaking power. An implication of our posts vis a a vis this thread, and what I consider a gap in climate modeling and discussions, is a clearer understanding and factoring in, of the role the oceans are playing in co2 uptake, exchange and mixing. Without doubt this role is not uniform or consistent because the temperatures and other properties of water, including the quantity of water, are variables. Great article. Now to be pedantic. “just 0.7 mm a year, or little more than a quarter of an inch over the decade.” is incorrect. Either you accidentally chose 0.7 mm (millimeters) instead of 0.7 cm (centimeters). Or you misinterpreted 0.7 mm as being 0.7 cm to arrive at a “quarter of an inch”. 0.7 mm is approx. 1/32 of an inch. 0.7 cm is a little over a quarter of an inch. The additional forcing would just be damped by the heat capacity of the oceans until they can reach the new equilibrium too. If carbon dioxide really does insulate then someone would be selling double glazed windows filled with carbon dioxide. or the owners of massive greenhouses filled with co2 over 1000ppm 24×7 would be telling us how they see an increase in temps compared to ones without. well welcome to the real world of an open atmosphere and not a greenhouse. In consideration of timeframes regarding heat transfer applications the earth’s core has been cooling for on the order of 4 billion years and it’s still pretty hot. My understanding is that systems never truly reach equilibrium, sorta like always getting halfway closer to your goal means you never arrive. It is no surprise then that climate sensitivity would take a long time to manifest itself. CACA advocates also say that the sun was less bright then, which is true. But solar irradiance fades at only about one percent per 110 million years, so the sun shone over 93% as brilliantly 750 Ma than now, not weak enough to compensate for so much more CO2 in the air if CACA orthodoxy holds water, so to speak. Co2 continues to rise and temperature (as best we can read it), does not. Co2 follows temperature in all known records. Nothing to do with the “slayers”. Just pointing out the bleeding obvious. The capitulation on Co2 is the biggest mistake skeptics have made. The “experiment” spoken of in no way, shape or form, represents our atmosphere. The main assumption is that GMT will continue to rise for centuries. However, historical data indicates that GMT variations include periods of cooling as well (ie LIA). During these periods cooler SSTs will result in an increase in CO2 solubility and a decrease in atmospheric CO2. Also the increased biomass pulling CO2 from atmosphere would also have some effect prior to cooling. http://stevengoddard.wordpress.com/2014/03/26/great-lakes-ice-obliterates-all-records/ as is the highly significant increase in Antarctic ice over the past 3 years (see CT today). To the UN and a great deal of Soviet psychological research, cybernetics is a theory of how human behavior can be controlled through psychological processes. I think alot of that nefarious research goes on & even originated in leftist US universities (IIRC, Goebbels got alot of his Nazi propaganda techniques from existing US practices employed during WWI). The US election committees employ alot of psycho and advertising majors. As we know that CO2 lags temperature by an average of 800 years then the factor Gt must be zero. an individual CO2 molecule has no temperature. the kinetic energy of a molecule is what we perceive as temperature. the confusion comes from talking about individual molecules. one might as well discuss sea level rise in the context of a drop of water. is this how glaciers start? “Nevis Range near Fort William has recorded snow fall every day for almost two months with some runs covered by 4.9 yards. The record day on Sunday came despite some chairlifts being out of action because they are buried in snow. There is so much of the white stuff that the slopes could stay open until the summer, management said. IIRC, Wally Broecker, one of the many “fathers” of global warming (a phrase he coined) & CACA, believes it would take about 1000 years for man-made CO2 to be scrubbed out of the atmosphere naturally. I might not be recalling correctly, however. Dear Lord Monckton, this is all good and well if one is to assume the earth to be otherwise unaffected by temperature feedback that arises from changing clouds. The temperature in the tropics has found its value, and is regulated quite well through clouds that appear earlier and staying later if it is getting warmer. Your analysis is quite good for the temperate regions, which could use a little warming. CO2 is our lifeline. The following is a review paper by a specialist in the atmospheric greenhouse gas calculation. Experiment data at the University of South Florida where sunlight and a long tube with different amounts of CO2 and other greenhouse gases was used to determine the raw forcing of the greenhouse gases and the interaction of greenhouse gases. As the paper review paper notes the CO2 greenhouse effect is reduced in the lower atmosphere due to the overlap of the CO2 absorption spectrum with the H2O absorption. In the lower atmosphere, for that reason, additional CO2 causes very little warming as that portion of the atmosphere is saturated, in terms of greenhouse warming for CO2 and water vapour. The general circulation models predict that the majority of the CO2 forcing warming should occur higher in the atmosphere and in the tropics as the most amount of long wave radiation that is emitted to space occurs in the tropics and there is less water vapour higher in the atmosphere. (The GCM predicted warming is then caused by the long wave radiation down from the higher regions in the atmosphere). The observed warming in the tropical troposphere is 100% to 300% less than what is predicted by the general circulation models (GCM). The fact that warming of tropical troposphere is 100% to 300% less than predicted by the GCM provides support for the assertion that there are fundamental errors in the general circulation models part of which are due to the incorrect modeling of clouds and provides support for the assertion that the IPCC ignores observations and analysis that completely disproves the extreme AGW hypothesis. There is no physical reason for there to be a delay in the CO2 forcing in the tropical troposphere. The 1000 to 3000 years to reach equilibrium is a ruse to hide the fact that the short term warming observed due to the recent CO2 rises without feedbacks in the tropics is 100% to 300% less than predicted by the general circulation models. “The main GHG’s spectra have been described and explained. The absorption characteristics of the GHGs indicate their relative importance in GH warming. The discussion is restricted to only a 100 m path length, the whole atmosphere being equivalent to one of 8 km at a pressure of 1000 mb and a temperature of 288 K. The basic spectroscopic data are presented and from these the absorption properties of the atmosphere are derived in the general circulation models. In addition to the properties of the GHGs, those of clouds, other aerosols and particulate matter are built into model programmes with a considerable degree of parametric uncertainty. The GCMs take feedbacks into account, such as the supposed positive feedback from extra warming caused by the absorption of radiation by extra water vapour. Such feedbacks have to be parameterised and although they may contribute a greater reality to the models, they also introduce extra uncertainties. all bases covered, so only if the weather stays the same year in , year out for ever will we know that we have co2 back to the level of , tell me again what level is it supposed to be? I have concluded that the assumed “sensitivity” relationship between temperature and the atmospheric concentration of CO2 is backwards. The rate of change in CO2 concentration follows the rate of change in temperature in all time scales from daily to over 100,000 years. Look at the data and come to your own conclusions. If Christopher Monckton is correct (I don’t even pretend to understand the mathematics) I’m a bit miffed; here in the UK climate prophets of doom earnestly promised ‘mediterranean-like temperatures’ as a result of all the CAGW predicted to come our way. I’ve already waited 20 years for that to arrive, to no avail. I was counting on it – even looking forward to it. I’ve had quite enough of this schizophrenic British weather, tbh. The laconically acronymic “RMF” says he would be wary of assuming that increased CO2 would have no impact on marine organisms. I did not say it would have “no impact”: I said it would “not make much difference”. The oceans are strongly buffered by the rock basins in which they lie, so that their pH cannot change much with the minuscule perturbations in atmospheric partial pressure that we are able to achieve by returning to the atmosphere some of the CO2 that once was there. The calcite corals first achieved algal symbiosis in the Cambrian era, 550 million years ago, when there was 25 times as much CO2 in the air as there is today. The aragonite corals ditto in the Jurassic era, 175 million years ago, when there was 12-15 times as much CO2 as today. Calcifying organisms are doing just fine, and will continue to do so. The eccentrically pseudonymious “patrioticduo” says that 0.7 mm/year, or little more than a quarter of an inch over the decade” is incorrect. Well 0.7 mm/year is 7 mm/decade, and 7 mm is a little over a quarter of an inch. Mr Kelly says that because CO2 concentration change lags temperature change by an average of 800 years the overall temperature feedback gain factor must be zero. Mr Haynie makes a similar point. However, theirs is a common misconception. Though it is clear on paleoclimate timescales that it is temperature that changed first and CO2 concentration change that followed, the CO2 concentration change was – and is – capable of reinforcing and amplifying the temperature change. It all boils down to Nyquist–Shannon sampling theorem. It’s really hard to interpolate a cycle that lasts longer than recorded history. CO2 has both rotational and vibrational excited states that can be distributed by temperature (not a true temperature, but still different than ground state). Looks like only the rotational states will be occupied at atmospheric temperatures at high pressure. Thus, hot vs. cold CO2 can be differentiated. I’m not sure that amounts to anything for your overall argument, but it’s still the case. By “isolated”, we mean an individual molecule that is NOT interacting (currently) with any other physical material. NO collisions; although it can interact with an electro-magnetic field. Ergo, per Einstein, such a molecule has no frame of reference, other than itself, so it has no kinetic energy. Any kinetic energy of a molecule can only become apparent, if and when, a molecule interacts (by collision) with other molecules, and then it is no longer isolated. Temperature is a macroscopic property of large systems (of molecules), and is characterized by the mean kinetic energy of molecules in a very large number of interacting molecules, and in the gas phase, the Maxwell-Boltzmann energy distribution would be found. So I agree completely with Richard Courtney on this. Richard and I have seldom differed in our positions. Now to be rigorous or pedantic, any “isolated” molecule is subject also to the gravitational force, which is infinite in range. Kinetic energy is only manifested when a collision occurs. As they say, The fall is harmless; it’s the stopping, that kills you. As for the exchange between Richard Courtney and AlecM, I have to say, I’m unable to follow AlecM’s thought process; dunno if Richard does either. In blow ups of the CO2 vs temperature profiles from ice cores show CO2 does not cause the temperature to start to rise and does note stop the temperature from going down then anything we are doing now cannot have an effect on decade time scales and Gt would be close to or at zero for any time from 1940 until now. I have concluded that the assumed “sensitivity” relationship between temperature and the atmospheric concentration of CO2 is backwards. The ice cores seem to support this. My two biggest problems with the ice core relationship of CO2 to temperature, is that for any given CO2 concentration the temperature is both rising and falling. That is, when it warms during an inter-glacial period, there is a rising concentration of CO2; then during the next cool-down to re-glaciation, the CO2 drops as does the temperature. Therefore the same CO2 levels occur during both warming and cooling, allegedly affecting the rise, and inert during the cooling. The second problem is if one assumes CO2 is driving the temperature, why is it that every time CO2 is at a maximum, we get glaciers? GEOCARB III shows over 26 times “pre-industrial” CO2 concentration (conventionally set at 300 ppm by mass) for the Early Cambrian peak (520 Ma; which time was cold) & for the Early to Middle Jurassic ~4.8 times at 180 Ma & ~8.6x at 170 Ma (when climate was cooler than during the Late Cretaceous, when CO2 was lower). For the last week, I have not been able to properly receive WUWT. Is anyone else having the same problem. I get no article, just comments. And the comments are not left justified, they’re center justified. Aditionally, there are lines overwritten. The problem is on your end. Thousands of people read WUWT every day with no trouble. You probably need to do one or all of these things. 3. Make sure your hard drive isn’t full. 4. Upgrade your video card drivers or the card itself. I’m guessing you aren’t computer savvy, or you wouldn’t be asking for help in this way. Take it to a local computer store and let them help you. However, I immediately thought of the default alarmists can move on to. Links found where none exist. They need for science, just assertion. “Human-caused carbon dioxide emissions in the atmosphere are being absorbed by the ocean and may have pushed local waters through a “tipping point” of acidity beyond which shellfish cannot survive, according to Chris Harley, a marine ecologist at the University of B.C. Rising ocean acidity is a global phenomenon, made worse by higher natural acidity in local waters, Harley said. The lower the pH, the higher the acidity. Local waters are typically a much-less-acidic 8.2. High acidity interferes with the ability of baby scallops to form a protective shell, forcing them to expend more energy and making them more vulnerable to predators and infection. Will there ever be a surrender? Yes, I completely agree with your post at March 26, 2014 at 8:24 am which adds explanation to my points. Also, my post you have kindly explained was requesting explanation from AlecM because – as I said – his assertions “seem to make no sense”. I must say the Wet Office don’t give up easily	, & I am delighted to see that they are covering all their arses, err……..I mean bases, by predicted that no matter what the weather does, e.g. too wet, too dry, too hot, too cold, it’s Climate Change! It reminds me of Drake’s because both of them seem to be built backwards. They wrote down the equation first and then they started looking for data that can support the equation. The way scientists discover laws is the following one: First they collect experimental data, then they study that data looking for relationships among the different variables and then after the relationships have been discovered, scientists can put them in form of an equation. (or equations) That is the Brahe-Keppler-Newton way. It seems to me that the equation above has the same problem. There are factors which values have not been measured experimentally rendering the equation as useless as Drake’s equation and the SETI program. In very dry regions, such as the poles, where air contains fewer water vapor than CO2 molecules, the gain of one CO2 molecule from three to four over the past century or so might have some slight warming effect. But in the tropics, where there can be 400 H2O molecules to four of CO2, not so much. Martin A. That ‘climate sensitivity’ can be meaningfully calculated is something that even skeptics seem to accept as true. Nobody doubts that a derivation from assumptions can be made. Lord Monckton takes a bunch of common alarmist assumptions and derives conclusions from them, which seems to show that if the alarmists are right, then there is nothing to be alarmed about. However, neither the assumption that the climate sensitivity is constant, nor that the “equilibrium” approximation is accurate about something on Earth, has a strong justification or has been tested. So any conclusion following from those assumptions may not be “meaningful”, and not all skeptics accept as true that they are meaningful. Four CO2 molecules per 10,000 dry air molecules in the above. I find it highly unlikely that, when dealing with a complex and chaotic system, a single variable–climate sensitivity–will have much predictive value. It seems more likely that climate sensitivity would be a function of several variables. I’ve never really bought the large positive climate sensitivity given the uncertainties of the models and the observed tendency of complex self-organizing systems to resist deviance from homeostasis. I would expect the climate sensitivity to be negative up to the tipping point. That’s why I’ve cast my lot with the using the radiation transfer equations as the basis for prediction and ignoring climate sensitivity. Climate sensitivity, though undoubtedly a significant factor, is so fraught with uncertainty as to be little more than a WAG (wild-a** guess). And just sticking with the radiation physics matches the trend from 1850 or so quite nicely. In dismissing the climate feedback constant we must also dismiss predictions that the climate, in a Gaian fashion, will counteract the CO2 forcing to maintain homeostasis, and we must also dismiss predictions of catastrophe. Either may happen; we just don’t know. That leaves the question at a rather uncomfortable stage. “Is climate change going to result in catastrophic warming?” Maybe. “Is climate change vastly over-rated?” Could be. Go ahead!….You go first. Turn off your electricity use, and park your cars for starters. Thank you for another fine post and for your responses to questioners. @ Clark gogostop I wasn’t trying to be rude or condescending in any way. You asked for help, and I gave my best advice. Your problem echoed several similar ones I’ve solved on PC’s. Since you didn’t give any details, all I could do was offer what worked in the past. I’m sorry if you took that advice the wrong way. On that note, if you are using the default Safari browser, we have had people report some issues with it that have been solved by using a different browser, or simply upgrading Safari to a newer version. WordPress.com recently upgraded their software, so it may be that safari is unable to render the new features. Best wishes for a resolution. Carbon Dioxide absorbs IR radiation at around 14 uM (link) and it’s only considered a greenhouse gas because it blocks some radiation that isn’t blocked by water vapor. By itself, it isn’t very good at blocking IR. For blocking radiation, double glazed windows rely on surface coatings. The purpose of the filler gas is to reduce convection losses. CO2 has been used for this but there are other issues (it isn’t inert) that cause warranty problems and manufacturers usually avoid it. @George e smith: I am simply applying the Law of Conservation of Energy and Maxwell’s Laws (via Poynting Vectors = monochromatic Irradiance) to the vector interaction of the surface and the (opposite direction) atmospheric Radiation Fields (the collection of Poynting Vectors over all possible IR wavelengths). This is simple physics at 2nd year undergraduate level. The Trenberth Energy budget with ‘back radiation’ aka ‘forcing’ bouncing back as part of the surface RF, now cast in the role of a real energy flux, breaches Conservation of Energy so can’t happen. Trying to put myself in the mindset of the believers has been fascinating. The Meteorologists and Climate Alchemists imagine that just because a pyrgeometer outputs a signal in units of W/m^2 means it is a real rather than a potential energy flux. Too many physicists imagine every body above absolute zero continuously fires out ‘photons’ at that total energy flux. The reality is that the only time you get the S-B equation energy flux is when the opposing RF is the zero point energy of a body at absolute zero. When you have radiative equilibrium between real emitters above absolute zero, the net real IR energy flux is the vector sum of all the PVs at the point or plane. The heat transfer rate is the negative of this. Planck never said why: I am trying to solve that problem. As an engineer I solve radiative heat transfer problems using the difference of two S-B equations taking (wavelength-dependent) emissivity, (wavelength-dependent) absorptivity and geometrical view factor into account! MODTRAN is perfectly correct; it calculate the RF at any plane in the atmosphere, not the net IR flux, the difference of opposing RFs. The IPCC has bolted on incorrect fizzicks! Yes, this is the fundamental tactic employed by Alarmists. It is supplemented by constant appeals for deference to “expertise” and to “consensus,” the latter being something that has no place in science. Having done everything in their power to avoid communication with the general public, they argue that the general public will approve Alarmist conclusions when scientists are better at communicating them. Alarmists are terrified of plain talk about their most important tools, computer models. Have you ever asked an Alarmist to state the relationship between a computer model and the observational evidence? Try asking them how the relationship differs from that between a scientific theory and its evidence. No attempt at communication will be forthcoming. Although I accept the calculations in this article to be “meaningful’, it does not follow that all calculations are “meaningful.” And, unless I missed it, this article does not address the very important issue of how much atmospheric CO2 is anthropogenic and that warming is beneficial. We don’t always have the luxury of fighting battles on a field of our choosing; our adversary sometimes get a vote on where the argument goes. In this case he probably chose badly as this article puts an exclamation point on the fact that at present rates CO2 doesn’t double for over 150 years and what percentage of atmospheric CO2 is anthropogenic is still much in debate. realclimate is claiming models predicted the pause. its being used on the comments section to counter the point the pause was not predicted. But i thought even ipcc admit they don’t know why? there are so many climate models guess one had to be right out of all the ones that were wrong. Which just goes to prove a consensus of climate scientists agreeing is irrelevant, you just need one to be right. Thank you. I’ll go back through WordPress.com, I haven’t done that yet. Thanks for the advice & glad to hear I’m the only one. Thanks again, sorry for the inconvenience. Do you know for a fact that the water vapor at the poles actually IS less than the CO2, in the atmosphere ?? If you take atmospheric pressure (at sea level) as 760 mm Hg (sorry for the non SI units), the 400 ppm, would be 0.304 mm Hg partial pressure. But we need to correct for molecular weights. The ratio is 1.528 so x 0.304 gives 0.464 mm Hg for the partial pressure of CO2 at sea level. So I suppose you are correct that at the poles, the winter time H2O is less than the CO2. But the water is in no way negligible, even at the poles. And who cares about global warming at polar night time conditions anyway ?? Your criticism is spot on. As regards our solar system, Kepler produced the first “equations” that contained a genuine variable. Take his Second Law: A planet’s speed in its orbit varies directly with the area swept by a line drawn from the planet to the sun. (This law was not quantified and rigorously formulated before Newton introduced his calculus.) The variable in this law is “the planet’s speed.” That variable can exist because the Second Law is a universal generalization that specifies what must be known if a value is to be assigned to the variable. The universal generalization was an acceptable statement because it was highly confirmed. What kind of structure does “consensus” climate science offer us that can illuminate the role of Climate Sensitivity in today’s climate science. They are not clear on whether transient Climate Sensitivity is variable or a constant. They will not be clear on such matters until they have provided one or more highly confirmed universal generalizations about Earth’s climate that contain a term for Climate Sensitivity. They have no idea how to do that. I have observed that there is a lag even on short time scales. The rate of change in atmospheric concentration lags the change in ENSO related SST by up to about a year depending on latitude. As for the possibility of amplifying temperature change of the sea surface by radiating at the temperature at TOA both up and down, what do you think is the probability that those downwelling photons will reach the surface having to go through a thick layer of clouds and water vapor? On top of that, those relatively small numbers of CO2 molecules have shared their energy with air molecules through collisions (which we measure as temperature) as they are transported by convection to the TOA. There is no hot spot in the upper atmosphere. I’ve been running Mac’s for many years as well. Occasionally WUWT won’t load correctly, but it usually because I’m overwhelming the memory capacity of the machine by having too many windows open at once. Also of note is that you are now two full generations of operating system behind. (I run 10.9.2) It many be time to upgrade, add memory, upgrade Safari, or even try firefox as an alternate browser. And that’s exactly how the CO2 believers should be forced to prove their CAGW claim. Two (2) identical greenhouses, one with 400 ppm CO2 …… and one with 1,000 ppm CO2 ….. and an auto “recording” thermometer to 1/10 degree accuracy in the center of each one ………. that records the temperature at 10 minute intervals ……over a period of 24, 48, 72 or 96 hours ….. ….. and then comparing the two number sets at the end of the test run. If CO2 is all that its touted to be, …… the two number sets will vary drastically from one another. First, many thanks indeed to today’s commenters for a civilized, illuminating, and scholarly discussion. The fact that quite a heavily technical posting has attracted so many comments is a tribute to the sheer quality of the readership that this admirably and amiably administered website has attracted. Many old stagers have contributed, but there have been several new voices too. I’m going to deal very briefly with several interesting points. I have more time to write than usual, because I am in bed with a broken toe, having stubbed it dashing to the telephone to take an unwanted cold call. Bah! AlecM says process engineers would laugh at the IPCC’s method of attempting to determine climate sensitivity. So they would, but not for the reason he suggests. The notion that CO2 interacting with outgoing long-wave radiation peaking in the near-infrared quite close to CO2’s key characteristic absorption wavelength does not breach the law of conservation of energy. The interaction induces a quantum oscillation in the CO2 molecule so that it emits heat directly, as though a tiny radiator had been turned on. If you turn on a radiator, you get heat. Process engineers would indeed laugh, however, at the notion of using the Bode feedback-amplification equation to try to model the climate without introducing a damping term to prevent the closed-loop gain from attaining the singularity at unity, which has a physical meaning in the electronic circuitry for which it was derived but has no meaning at all in the real climate. Mr Kelly, Mr Keohane, and highflight56344 all have difficulty with the notion that on all timescales CO2 concentration change lags temperature change, and yet CO2 concentration makes the atmosphere warmer than it would otherwise be. Meditation on the difference between the absolute value C of CO2 concentration and the change ΔC in that value may assist. Mr Kelly also asks why we get glaciers every time CO2 is at a maximum. We don’t, but it has been known, though not in the past 420,000 years. Steve Oregon reminds us usefully that the fallback position of the profiteers of doom is ocean “acidification”. The three most powerful of the many arguments against the notion that our tiny alteration of the partial pressure of CO2 above the ocean will hurt calcifying organisms beneath the foaming briny are 1) that some of the oldest of those organisms – corals – evolved at a time when CO2 concentration was up to 3 orders of magnitude above today’s; 2) that calcifying organisms thrive in a very wide interval of ocean pH, particularly along the coasts, where pH is hugely variable; and 3) Professor Plimer’s knockdown argument that the oceans are so overwhelmingly buffered by the basalt rock basins in which they lie that their response even to major changes in the atmospheric and hence oceanic partial pressure of CO2 is remarkably homeostatic. Highflight56344 says that, all other things being equal, less concentration of H2O is a cooler atmosphere. Amen to that: but, by the Clausius-Clapeyron relation, a warmer atmosphere may carry near-exponentially more water vapor, though the ISCCP data do not suggest that it does. Urederra says the climate-sensitivity equation reminds him of the Drake Equation in that both have too many unknowns. Amen to that too. I used that very analogy in my last Heartland talk and also at last year’s planetary-emergencies meeting of the World Federation of Scientists. Appreciative chuckles from both places when I referred to the climate-sensitivity equation as “the Quack Equation”. Chief among the many refractory unknowns are the temperature feedbacks. Milodonharlari says the influence of CO2 is not as great in the tropics as at the poles, because in the tropics water vapor gets in the way. Not in the upper troposphere it doesn’t. Subsidence drying (see Paltridge et al., 2009) allows CO2 to exercise a greater role in the tropical upper air than elsewhere, not least because that is where most of the Sun’s heat comes in. Any additional heat in the tropical upper air tends to be advected poleward by the baroclinic eddies that predominate in the extratropics, accounting for polar temperature amplification. But the absence of the predicted tropical mid-troposphere “hot-spot” is a serious blow for the models. They are more obviously wrong here than anywhere else, as Christy (2012) has dramatically shown. Commiebob says CO2 absorbs infrared radiation at around 14.99 microns and is only considered a greenhouse gas because it blocks some radiation that isn’t blocked by water vapor. By itself, he says, it isn’t very good at blocking infrared radiation. Again, one must bear in mind that there is very little water vapor in the upper air. It is there that CO2 comes into its own as a greenhouse gas. In the lower troposphere, its principal absorption wavelengths are indeed overwhelmed by those of water vapor. George E. Conant says that “Yet another sore point is the apparent outright misrepresentation of data to drive a globalist agenda that ultimately orders everyone to surrender their sovereignty and subsequently any vestige of freedom humanity may have left”. Yes: and that is why the first of what may prove to be a number of fraud cases is inching its way towards the public prosecutors. Michael Mann has whined on Twitter that it is outrageous for me to excoriate the dreadful Torcello for demanding that skeptics be imprisoned when I have said that climate fraudsters should be and will be locked up. Well, to be skeptical is to be scientific: to be fraudulent is to be criminal, even if the fraud is fashionable. Mr. Conant says the “climate non-debate” is about honesty and truth. Hear, hear! Give that man a peerage. Theo Goodwin says: “Have you ever asked an Alarmist to state the relationship between a computer model and the observational evidence? Try asking them how the relationship differs from that between a scientific theory and its evidence. No attempt at communication will be forthcoming.” I recently did exactly that in a debate against the treasurer of the Royal Society at Oundle School. He was reduced to gasping incoherence and eventually spluttered that I had been “dishonest”. To ask a question, however, is not dishonest. In the immortal words of Housman’s Greek Chorus, “I only ask because I want to know”. PHMinSC says the head posting “puts an exclamation point on the fact that at present rates CO2 doesn’t double for over 150 years and what percentage of atmospheric CO2 is anthropogenic is still much in debate”. Exactly. It’s wonderful what the introduction of a few key quantities into the hand-waving arguments of the IPCC and its lickspittle coterie does to evaporate their case. Finally, Mr Haynie asks what is the probability that those downwelling photons that have interacted with CO2 will reach the surface after going through a thick layer of clouds and water vapor. Well, the behavior of clouds and the fact that water vapor is not well mixed in the atmosphere are two of the many substantial uncertainties that prevent the science from being as settled as the anti-scientists say. Among the many outright falsehoods that have for so long underpinned the extremists’ case, perhaps the greatest is their claim of certainty. A la larga, as they say in the casinos of Puerto Rico, the experiment will be run until it is blindingly obvious even to the true-believers that the New Religion is false. But how many trillions will have been squandered purposelessly in the meantime? And what of the future of a race set apart from the beasts by the degree of its intelligence, if its governing class spits so long and so determinedly on the quest for truth that is the end and object of science herself? Samuel I think they should be made to live in a bio-dome that has zero CO2 in it. They must grow their own food. And they can find out if they freeze to death. I rather doubt that ice core data could verify any such thing. What the available ice core data does appear to show is that the relationship is the reverse of what the IPCC assumes. That is, global temperatures affect CO2 concentrations, not the reverse. So, even what the good Viscount writes is directly contrary to the only truly long-term data available (not even the Central England Temperature data set is “long term” data in global geological contexts). Indeed, the ice core data seems to show a lag between temperature and atmospheric CO2 concentration of the same magnitude, but of opposite sign. So, the available empirical data, collected outside the laboratory (but still proxy data), do not seem to support any significant effect, either warming or cooling, on planetary temperature by atmospheric CO2. It simply does not appear significant to climate. My whole point is that there is near zero (0, Nought, Zilch, Nada) NET CO2 15 micron IR energy emitted by the surface to be absorbed by the nearby (‘absorption depth ~10 m) atmosphere. It’s because that band is self-absorbed and mutually annihilates the same wavelength range surface IR emission to the atmosphere. Therefore, there can be no atmospheric warming from this cause (even if it were possible because Tyndall’s Experiment has been badly misinterpreted, but that’s another story). What would, in the absence of any other factor, cause up to 1.2 K no-feedback CO2-AGW, for doubled pCO2, is the reduction of NET surface IR in the expanded 15 micron band wavelength range. Because the sum of convection, evapo-transpiration and NET surface IR has to be equal, on average. to the 160 W/m^2 thermalised SW at the surface, the surface temperature will rise until increased convection and evapo-transpiration makes up the shortfall. This is basic coupled convection and radiation which I have measured ad nauseum is steel plants, aluminium plants and elsewhere for many decades. You can do your own experiment with a beach windbreak. Reduce convection and the sand temperature increases to increase NET surface IR. Take away the windbreak and the sand temperature falls as convective heat loss increases. There is no analytical solution for the separate heat transfer coefficients so you get tables in handbooks: I used McAdam’s ‘Heat Transfer’. It’s in computers now. So, we have near zero extra CO2 15 micron band GHG-IR absorption, no back radiation and the maximum CO2 climate sensitivity, in the absence of any other factor, is ~1.2 K. However, there is another factor I intend to publish reducing real CO2 climate sensitivity to near zero, as shown experimentally. That means the real AGW we had in the 1980s and 1990s was from something else: I submitted a paper to a Nature journal 2 years’ ago and had it bounced back in 48 hours because i show in it that Sagan’s aerosol optical physics is wrong and the sign of the indirect AIE is reversed!. To get it published I have to tell the Physicists that much of their experimental astrophyics is also suspect, not easy! That the equilibrium global surface air temperature rises proportionately with the rise in the logarithm of the of the CO2 concentration is a premise to Mr. Monckton’s argument. The proportionality constant is “the equilibrium climate sensitivity” (TECS). The IPCC and Monckton assume TECS to be a constant. Sometimes the two parties differ about the magnitude of this constant. On windows hit CONTROL-F5, you have corrupt css stored in temp files. its either that or you set a magnification/font change just o the one site. Considering that (1) there has been a net cooling since the 1930s despite a 40 percent increase in atmospheric CO2, (2) with the recent cooling (since 1997) all the warming since 1950 has already been reversed, (3) the ample historical and geological records pointing to high temps/low CO2 and low temps/high CO2, I fail utterly to be persuaded that there is ANY sensitivity of climate to CO2, that is statistically distinguishable from zero, WHATSOEVER. Bravo for you, Sir. Your heroic efforts in behalf of science and humanity are greatly appreciated. I’d like to address the question that the treasurer of the Royal Society didn’t want to address. The relationship between a scientific theory and its evidence is manifested in the comparison of the predicted to the observed relative frequencies of the outcomes of events by which this theory was statistically validated. The IPCC’s computer models do not reference events or their outcomes hence being insusceptible to being validated. The computer models are susceptible to being “evaluated,” a scientifically meaningless concept that can be confused with “validated” because the two words sound similar. In an “evaluation,” projections (NOT predictions) of the computer models are plotted on X-Y coordinates along side a global temperature time series. Skeptics who believe, with Mr. Monckton, in the constancy of the equilibrium climate sensitivity are duped into thinking they are looking at an attempt at validation of the computer models. This deception works on most skeptics. Phew. This has to be the best response I’ve ever gotten. It’s refreshing to see somebody with technical knowledge explaining everything step by step, and I can’t imagine the effort it took you uncover what exactly the IPCC was saying. (I suppose you’ve read Montford’s book on the hockey stick so this seems to be the norm in climate science!). Of course I don’t understand a thing about the equations, but it seems the biggest difference in all the climate sensibility scenarios is in the long-term effects. So if somebody says the warming resulting from a CO2 doubling is 1ºC, and the IPCC says it’s 3ºC, they obviously disagree in much warming will take place this century and the following. But the real disagreement is in the warming beyond that, as IPCC predicts Greenland will melt down, which will create further feedbacks and so on. Something tells me their Greenland prediction would look as smart as the one about the Himalayas. I might not be able to watch Greenland melt in the year 2200, but we can always get Ray Kurzweil to check it out. So thanks a lot. I’ve bookmarked the post so if/when my math moves beyond caveman level I will come back. I generally agree with Monckton’s summary at 11:47 but take exception to discussion of acidification as a fallback. Granted, ocean acidification is a conclusion sometimes offered by climatologists with little to no training or experience in ocean systems, so I comfortably consider the claims they proffer about the oceans with strong skepticism. That being said, study of the oceans per se in the context of AGW is fairly recent comparatively. At any rate, my point is more so that since most study of the oceans is done by scientists outside of climatology as used here, I am quite comfortable examining and and accepting their claims and processes, which are in no way characterized as “settled” or complete. For instance, the claim, ocean ph has dropped 25%, invites a host of points and conversations about the processes and implications. As well, an individual CO2 molecule cannot produce sound. Some properties are macroscopic and others are microscopic. I’m delighted that El Comendador is happy with my perhaps unexpectedly detailed response to his interesting question about when the warming predicted by the IPCC is predicted to occur. 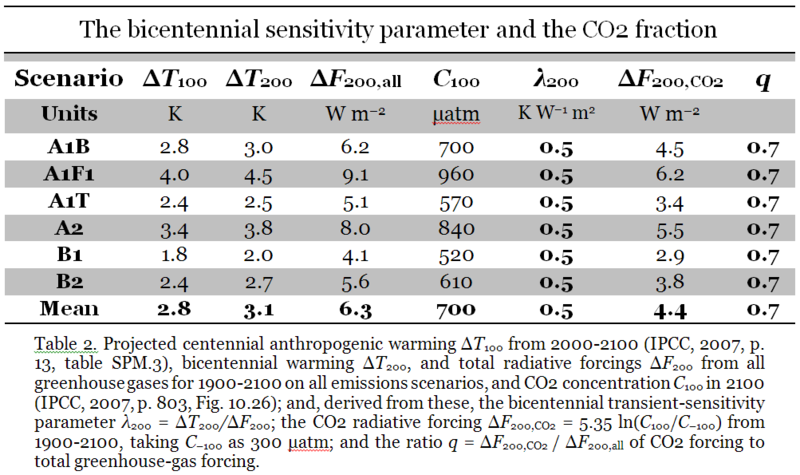 As he will have appreciated, the relevant data are in table 2 of the head posting, which demonstrates that the climate-sensitivity has risen from an instantaneous 0.31 Kelvin per Watt per square meter to 0.5 K/W/m2 after 200 years, on its way to an eventual 0.88 K/W/m2. Multiply this parameter by the 3.7 W/m2 radiative forcing and you get the warming after 200 years – about 1.8 C. Not a lot to worry about. The rest will happen much more gradually. And El Comendador need not worry about Geenland’s icecap anytime soon. As the head posting shows, Greenland was 2.5 K warminer 8000 years ago today, and the ice (except at the low-lying coastal fringes) did not melt. This is not the place to talk about the trade-off between latitude, altitude, ambient temperature and the thermal inertia of large ice masses, but the notion that Greenland’s icecap is going to disappear anytime soon can be dismissed as mere rodomontade. Mr Oldberg, as usual, filfully misunderstands the head posting, redfines several terms confusingly and inaccurately, and fauils to appreciate that when I present the IPCC’s methodology, including its determination of equilibirum climate sensitivity, I do not necessarily agree with it. Indeed, the purpose of the head posting was merely to show that, even if one did agree with it, there is very little to worry about. And, whether Mr Oldberg likes it or not, one way to validate a computer model is to test its predictions (a projection is simply a form of prediction, and the two words may be used interchangeably without loss of clarity or rigor) against what has actually happened. Models that examine the question how fast the world will warm in response to our forcing of the climate can best be validated, therefore, by repeated comparison between the warming they predict over a given period and the warming that is observed and measured over that period. It is really as simple as that. And the models have failed, relentlessly, on the side of extravagant exaggeration. RMF says he does not like me calling “acidification” a fallback argument of the true-believers. And he seems to suggest that most researchers into ocean pH are Olympian in their detachment from the debate about climate change. Alas, that is not so: just as with warming, so with “acidification”, a small band of politicized extremists led by one Hoegh-Guldberg in Australia are busy pushing the argument well beyond where true science would allow it to run. To take one example, the notion adumbrated by RMF that ocean pH has fallen by 25% since Man first began to influence climate is entirely absurd and without foundation. There is no systematic measurement of ocean pH worldwide. Local measurements are unduly affected by coastal influences such as rainfall runoff. And a prize is still available for anyone who can devise an automated method of measuring pH throughout the world’s oceans. There is no sound empirical evidence that ocean pH has changed at all, and no sound theoretical reason for supposing that it woiuld do much harm to the calcifying organisms if it did. Thank you for taking the time to respond. Among the claims that you make in your response is that “…one way to validate a computer model is to test its predictions (a projection is simply a form of prediction, and the two words may be used interchangeably without loss of clarity or rigor) against what has actually happened.” This happens to be a topic on which I have conducted a study and reported my finding in a peer-reviewed article. This article is available to you at http://wmbriggs.com/blog/?p=7923 . In brief, my finding is contrary to your claim. When “prediction” and “projection” are used as synonyms in making a global warming argument the effect is to make of this argument an equivocation. An equivocation is an argument in which a term changes meaning in the midst of this argument. By logical rule, one cannot draw a proper conclusion from an equivocation. To draw an IMPROPER conclusion is the equivocation fallacy. One need not be “Olympian” to do basic research and studies of the ocean, one merely need not have the conclusion prior to the work. Monckton, you’re not suggesting it’s not useful to theorize about ocean ph or to theorize and carry out studies on how ph affects marine forms, are you?? Monckton of Brencheley – you have not responded to the issue I raised March 26 5:52am about how it is totally inappropriate to apply Stefan-Boltzmann equations to the transparent thin surface layer of the oceans. As more than 99% of solar radiation passes through the first 1cm the absorptivity is less than 0.01. The models are wrong in assuming this surface layer receives most of its thermal energy from radiation. It in fact receives over 99% by conduction and convection. Considering the mean free path of molecules, there are ample molecules in that 1cm layer to determine the temperature of the first 1cm layer of air above the surface, because molecules collide at the interface and exxchange kinetic energy. Hence the temperatures of these two layers are very close and should be reflected in about 70% of the temperature records that are used to determine global means. How can carbon dioxide back radiation (which is pseudo scattered anyway) affect such temperatures when the main energy input is non-radiative? RMF misunderstands me. I am not consigning legitimate bioresearch in the oceans to the dustbin. No doiubt there are armies of diligent marine biologists beavering away with an impartiality and and indifference to the over-politicized debate on the climate that is as commendably detached from mere politics as the Gods of Olympus were said to be. However, it is true that a small band of trouble-makers, just like the small band of trouble-makers who have peddled the global warming nonsense, have been whipping up a scare about supposed “acidification” of the oceans that is largely nonsense. The very term “acidification” is a give-away. The oceans are pronouncedly alkaline. They were last acid, for a brief and largely unexplained period, some 55 million years ago (you’re too young to remember). And when we talk of “acid”, it need not be particularly strong acid. The mean pH of the oceans is 7.8-8.4, with wide variations along the coasts, particularly in South America. That interval is decidedly alkaline. The pH of rainwater, however, is pronouncedly acid at 5.4-5.6. Yet calcifying organisms thrive along coastlines prone to flooding (think Brisbane River & Great Barrier Reef). Dr Ha’n justifiably com,plains that I had not replied to his earlier posting to the effect that one cannot apply the Stefan-Boltzmann equation to the ocean surface. However, after a diligent rereading of the head posting i can find nothing in it that makes any such suggestion, so I fear there has been a breach of Eschenbach’s Rule. True, the instantaneous or Planck value of the climate-sensitivity parameter lambda, at 0.31 Kelvin per Watt per square meter, to which I did refer in the head possting, is indeed the first derivative of the Stefan-Boltzmann equation. However, this parameter is derived not at or anywhere near the surface at all but at the characteristic-emission altitude, about six miles above us halfway up the troposphere, at which incoming and outgoing fluxes of radiation are by definition identical. I once spent a happy weekend with some 30 years of mid-troposphere temperature change kindly supplied by John Christy, determining for myself that the value 0.31 K/W/m2 used by the models is correct. At least they got something right. But it was my realization that just about none of the true-believers who were saying The Science Is Settled had the faintest idea how this parameter was actually determined that made me realize we were dealing not with science but with Communistic politics. I’ve been appeased, but that probably has more to do with dinner. Thanks, Christopher, Lord Monckton. Very good article. Thanks for pointing to the alternate solution for the evolution of the climate-sensitivity parameter. This might partially explain the overshoot in the GCMs that use the faster-temperature-rise solution. Monckton of Brenchley Implicit in your article is the assumption that carbon dioxide warms the surface by the process of back radiation as “explained” in IPCC documentation. That also is then supported by Stefan-Boltzmann calculations based on the sum of insolation and back radiation. You have not answered my point and thus your whole argument is as fictitious as the greenhouse conjecture itself. I have studied the physics of radiative heat transfer and thermodynamics extensively, so I suggest you have your response reviewed by a physicist with similar knowledge. Monckton – continued You must be aware of the claim regarding 33 degrees of warming. This is obviously calculated using S-B applied to the surface, which acts nothing like a black or gray body because 70% of it at least is a thin transparent water surface, and black and gray bodies do not transmit any radiation by definition. Yet your sensitivity calculations are based on similar assumptions. Does water vapor cause about 25 degrees of that warming – say 10 degrees for every 1% WV? If so, show me data indicating that loactions with 4% WV above them are 30 degrees hotter than those with 1% above them at similar altitudes and latitudes. Alex Ha’n: there are few physicists with the appropriate knowledge. I suggest that Lord Monckton contact Will Happer of Princeton, who warned ‘the team’ 21 years’ ago that they had got the IR physics wrong. Alternatively, I could be contacted, but I am just a humble Metallurgical Engineer with a PhD in Applied Physics and a seriously bad reputation for iconoclasm! Thanks AlecM – I may ask Will Happer and yourself to review a comprehensive paper I’m writing which ought to be the last nail in the greenhouse coffin, but of course Monckton will continue pulling out the nails with complete disregard for physics and reality throughout the Solar System, where, at least on other planets it seems, physics works altogether differently. Well, I don’t have a very good feel for what “2nd year undergraduate level simple physics” would be.. I had five full years of physics in high school, long before I ever set foot on any University campus, starting at around age 13. Well we did some dabblings in “mechanics ” (statics & dynamics) during the two years before that. But I understand conservation of energy, and also Maxwell’s equations, since I did take Radiophysics, as one of my three physics majors at he University level (that was third year). Don’t quite see how to apply that (simply) to CO2 changes. I would think that monochromatic irradiance would be nearly zero, except for perhaps today’s lasers, since in thermal radiation spectra, at ordinary Temperatures, the energy at any single wavelength would be miniscule. But maybe RichardsCourtney can explain your idea to me, once he figures it out. And the numbers in Kevin Trenberth’s “energy budget” are actually power numbers, not energy numbers; well more rigorously power areal density numbers. P = dE / dt which is an instantaneous differential quantity, which is the slope of an energy versus time graph. Well this is a bit far off Christopher’s thread subject. In that post, Robert Brown was incorrect in assuming perpetual motion occurs because what does happen is that a state of thermodynamic equilibrium evolves with maximum entropy in any system or combination of connected systems, and, since this state has no unbalanced energy potentials, it is isentropic with a thermal gradient such that the sum of mean molecular kinetic energy and gravitational potential energy is homogeneous. Wrong. Solar radiation spectrum peaks between 500 to 750 nm wavelengths. The path length in water is 1.5 m depth for transmissivity to be zero (Beer-Lambert law). The emissivity of water is 0.95 hence it absorbs 95% of incident radiation. Water is close to being a blackbody radiator. You are saying no warming after equilibrium is attained. But equilibrium is only attained after the surface temperature increased to match the back radiation. Convective cooling will only increase after increase in surface temperature (or else the wind must blow harder in response to back radiation but the wind does not have a mind of its own). @Dr Strangelove: you are correct. Double pCO2 and the increased atmospheric Radiation Field will cause less surface IR emission, meaning its temperature will increase by ~1.2 K to ensure that the total rate of heat transfer to the atmosphere is 160 W/m^2. However, another processes kicks in and reduces that temperature rise. Its called the hydrological cycle plus some other factors. Those other factors are negative feedbacks. They are hard to calculate theoretically. They are empirically estimated. Using satellite data, Spencer found strong negative feedback giving a climate sensitivity of 6 W/m^2/K. If this is correct, TCR is < 1.2 K per doubling of CO2. The surface will be heated by conduction if the air is not moving and convection if moving. Since air is always moving, conduction is negligible. The convective heat transfer coefficient of natural air flow is 25 W/m^2/C. 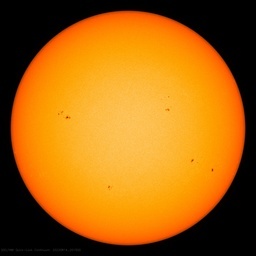 The solar and back radiation hitting the surface is 525 W/m^2. For convection to equal radiation, the air must be 21 C hotter than the surface. So it’s not true that 99% of surface heating is by conduction and convection. That would mean air is 2,000 C hotter than surface. Dr Strangelove would do well to read my “continued” comment afer the one he quoted which referred to just the first 1cm out of the 150cm he discusses in the ocean thermocline. Actually, measurements show the solar insolation penetrating more like 10m. but that is not an important issue, Even If only 95% of the radiation passes through that 1cm thin transparent layer of water, then all the rest of the energy it receives comes from the thermocline below and some from the air just above – virtually all by non-radiative processes. The 1cm surface layer is very transparent to solar radiation, as we all know. As such it does not act like a black or gray body by definition. There is very little actual data and global coverage appears to be insufficient. In addition, warming does not seem to affect ocean acidification . According to climate science, wind speed appears to be the principle variable governing dissolution of CO2 in the oceans and that is modeled. Please see my comments here, here, here and here. From surface water partial pressure (pCO2) measurements, Gruber et al. (2009) obtained for the time period 1995–2000 a global uptake rate of 1.9 [1.2 to 2.5] PgC yr–1 , and Takahashi et al. (2009) found 2.0 [1.0 to 3.0] PgC yr–1 normalized to the year 2000. The consistency between these independent calculations provides high confidence that the ocean is taking up anthropogenic CO2. In short, the IPCC is basing its assessment of dissolution of anthropogenic CO2 on Takahashi et al. 2009 and Gruber et al. 2009. The claim that Takahashi et al. 2009 is “independent” from Gruber et al. 2009 is not completely supportable. Mr Old refers me to what he ambitiously describes a “peer-reviewed” blog posting, a novelty that may yet, perhaps, prove valuable but has not done so in the present instance. Dr Briggs’ introduction to his posting falls a long way short of being any form of endorsement. In that posting, Mr Berg quibbles about whether “projection” and “prediction” mean different things. While definition of terms is desirable, pushing it beyond what is necessary is mere futile pedantry and has more than a little childish pettiness in it. And, one suspects, Mr Old’s boring persistence in banging on and on about this and similar useless points is really intended to derail threads such as this. Fortunately, he has left it too late this time. The facts are that not the least of the purposes of climate models is to attempt to represent the real climate with sufficient plausibility and resolution to run the model forward and predict what will happen next. It matters not one jot whether one calls the predictions of a model “predictions” or “projections” or “potatoes”. Let us call them “potatoes”. The models’ potatoes have constantly proven exaggerated when set alongside the real-world results the potatoes are supposed to represent. No amount of quibbling will alter that fact. If Mr Berg chooses to use words in a sense distinct from that which ordinary people would use them, that is his privilege: but he must not expect anyone except fellow pedants to take him seriously. I, for one, will call the predictions of a model “predictions”, and, when they fail, I will not attempt to excuse the failure by rebranding them “projections”. And if Mr Old were really as insistent upon using the correct term, I am not “Mr Monckton” but either “Lord Monckton” or, if Mr Berg prefers not to use the title, “Monckton of Brenchley”. If Mr Old wishes to be pedantic, let him be consistently pedantic. I’ve learned that When I attempt logical discourse with you are almost certain to drift off topic thus destroying the thread of the conversation. Often, you drift onto the different topic of alleged flaws in my character. This, of course, is the well known debating tactic of the ad hominem argument. Experienced debaters use this tactic only when cornered for members of the audience are apt to know that the argument is fallacious and discount it. In your latest use of this tactic, you hang the deprecating label of “pedant” around my neck though whether or not I am a pedant is unrelated to the topic of the equivocation fallacy in global warming arguments. It is not hard to guess why you changed the topic. Were you to disambiguate terms in the language in which you make your argument thus avoiding use of the equivocation fallacy it would be clear to the readers of your argument that your model is neither validated nor susceptible to validation because this model lacks an underlying statistical population. Actually I do not have any difficulty what-so-ever with a time lag WRT temperature and CO2. But the proponents of CO2 driving the climate do not acknowledge the same, thus I was proposing from their stance, and concluding it makes no sense since the same levels of CO2 exist during warming and cooling times from their perspective. Mr Kelly also asks why we get glaciers every time CO2 is at a maximum. We don’t, but it has been known, though not in the past 420,000 years. I asked the same, and in fact we do re-glaciate at peak and dropping levels of CO2 while we are in this ice age, the Holocene being a brief respite, every 100K years or so. The selectively pedantic Mr Oldberg – who perhaps deliberately gets my name wrong – is too late to divert this thread with his usual waffle about what, in the present context, is the spectacularly and transparently irrelevant distinction between “prediction” and “projection”. He also repeats, again fortunately too late to derail the thread, his nonsense about “absence of a statistical population”. The matter is very simple, yet even simple is probably altogether beyond him. The models predict how much global warming should be occurring. The thermometers measure how much global warming is actually occurring. The models’ predictions are shown to have been relentlessly exaggerated. And that’s that. Even the IPCC, after years of resistance, has begun to notice the elephant in the room. It has accepted that the models have failed in one of their primary purposes, and it has adjusted its predictions accordingly, though they may well still prove excessive. If Mr Oldberg wishes to witter on about the difference between prediction and projection, let him send his waffle to a reviewed journal and see how far it gets in the direction of publication. Meanwhile, I shall not be deterred by his pompous irrelevances from continuing to provide clear visual representations of the behavior of statistical populations. Everyone but Mr Oldberg would call them graphs. A model of this kind conveys no information to a policy maker about the outcomes from his or her policy decisions. By conflating “prediction” and “projection” one creates the appearance of information. Is this what you wish to do? Prediction vs. projection in this case is a semantic distinction without a functional difference, IMO. A hand-waving waffle that can’t obscure the reality of massive model failure on biblical epic scale. About 70% of solar radiation does reach the surface, and if received by the ocean, is absorbed in the top 100 meters, warming the 100 meter zone. The argument that IR does not penetrate the surface layer but SW does appears frequently but actually means little, because whatever the modes of heat transfer involved a heat balance at the surface must short-term net to zero. True, a joule absorbed at 100 meters must reach the surface to be radiated (or evaporated or convected away) and it does this by liquid phase convection, aided by turbulent mixing of the surface layer. I concur. I raise the issue of acidification as one key area of ocean study where there are enormous gaps and yet, growing sound and fury. We have a generally solid physical and chemical theory of the co2 uptake and yet, little concrete findings and materials, and very few species specific studies. I am again shocked by the IPCC statements on “global” acidification as there is not one global ocean nor one measurement nor one single species. This all leads more or less to the points Bill makes on his posts about the oceans. May I assume that the delay in your response to my recent comments is that you are indeed seeking professional advice from someone well versed in radiative heat transfer physics and thermodynamics? The key issues are that raised by BigWaveDave two years ago (linked in a comment above) and the fact that sensitivity calculations are based on applying Stefan-Boltzmann calculations to a surface of which 70% may be considered to be a 1 centimetre thin layer of transparent water, and thus not a black or grey body. As you will learn, several of us in Australia with a background in physics have been able to expose the errors in the greenhouse concept and explain reality with the science mentioned by BigWaveDave. When I submitted a report on my study to Curry for publication in the blog which she edits, she played the role of peer-reviewer. The report went through several drafts in response to her comments. Curry published the final version under the title “The Principles of Reasoning: Part III. Logic and Climatology.” The URL is http://judithcurry.com/2011/02/15/the-principles-of-reasoning-part-iii-logic-and-climatology/ . I employed this new found knowledge in a critique that I wrote on its draft report for the United States Global Change Research Report; I submitted this critique to that organization in 2013. Later, I submitted my critique to Dr. William Briggs, asking him if he was interested in publishing it in his blog as an entry in his “Spot the Fallacy Contest.” Briggs holds the MS degree in atmospheric science and PhD degree in mathematical statistics. He is an adjunct professor of statistics at Cornell University. Briggs edited my text for brevity and clarity and published it in his blog under the title “A Common Fallacy in Global Warming Arguments.” The URL of this article is http://wmbriggs.com/blog/?p=7923 . Dr. Vincent Gray has read “A Common Fallacy…” and given me his congratulations on my logical professionalism in writing it. Gray has published articles (“Spinning the Climate” and “The Triumph of Doublespeak”) on the same topic. In fact, it is from one of these articles that I first learned of the existence of this fallacy in climatological arguments. Gray holds the PhD degree in Physical Chemistry from the University of Cambridge and has taught climatology in several universities. He has served as an IPCC expert reviewer for many years. My articles serve to formalize Gray’s contentions by framing them as a proof. They prove it is through applications of the equivocation fallacy that IPCC-affiliated climatologists reach their major conclusions. ever been applicable to any of the postings here that he has tried to derail – in the present instance unsuccessfully. He is not even capable of getting my name right, confirming what all have long suspected – that he is a troll intending merely to cause annoyance by wandering from the topic at hand. A less generous moderation policy would have banned him long ago for wasting everyone’s time – notably including his own. I recommend an elementary textbook of logic – Hodges perhaps. If one discounts the illogical ad hominem portion of Mr. Monckton’s argument and his modification in the definition of the term “equivocation” from its definition in the philosophical literature one is left with his claim that there is not a difference in the meanings of “prediction” and “projection.” That there is a not a difference is asserted by Monckton but is not proved by him. Lacking proof, he has resorted to the logically illegimate tactic of argument by assertion. In contrast, the articles that I have cited to Monckton prove there is a difference by logical argument. If the meanings of “prediction” and “projection” differ, then in drawing the conclusion that there is not a difference between the two terms Monckton is guilty of the equivocation fallacy. My articles and those of Vincent Gray prove him to be guilty of it. If one discounts as illogical the persisting and rather childish ad-hominem misstatement of my name by Mr Oldberg (whatever else I be, I am not “Mr Monckton”, I have not, as he suggests, altered the definition of the term “equivocation”: I have merely pointed out that unless the definitions of two terms are sufficiently distinct they may serve interchangeably in an argument without diminishing its validity. Mr Oldberg then breaches the Eschenbach Rule – as he all too often does – by alleging that I had said something I had not said. He says I made a “claim that there is not a difference in the meanings of ‘prediction’ and ‘projection’. I made no such claim. However, I pointed out – which is no more than common sense – that the definitions are sufficiently close to one another to be interchangeable in the particular context in which the IPCC, climate modelers, the international scientific community, and I use them interchangeably. Whether Mr Oldberg likes it or not, the IPCC, in particular, frequently uses the word “predict” when Mr Oldberg would apparently prefer it to use the word “project”. If he really wishes to make a difference rather than make a nuisance, he would be better off trying to lecture the IPCC about how many angels can dance on his pinhead than trying to lecture me from what appears to be a standpoint of invincible ignorance. I have had a university education in this stuff: he, manifestly, has either had no such education or has made a remarkably poor use of it. Mr Oldberg says I use the “logically illegitimate tactic of argument by assertion”. If Mr Oldberg knew anything about logic – and almost every time he mentions it he commits an error – he would know that in logic is defined as one or more propositions (i.e., declarative assertions) followed by a conclusion. All arguments in logic are arguments by assertion. Mr Oldberg, clearly feeling the strain of swimming way out of his depth in the paddling pool of intellectual discourse without either the water-wings of knowledge or the muscles of experience, next asserts that a syllogism is an argument whose conclusion is known to be true. This is a misunderstanding of the very end and object of logic that so fundamental that one does not know whether it is really worth trying to educate Mr Oldberg at all. But here goes, just for fun, for my toe is not yet healed, so I am confined to barracks for another few days. A syllogism is a particular form of argument comprising a triad of connected propositions, so related that one of the three (the conclusion) necessarily follows from the other two (the premisses). The end and object of logic is to determine whether the premisses of any argument, including the premisses of a syllogism, necessarily and validly entail the conclusion. If the premisses necessarily entail the conclusion, the argument is logically sound. But the conclusion may or may not be true. The conclusion of a logically valid argument is true if and only if each of the premisses is true. All skerfuffles are chunderoids. This glapsplot is a skerfuffle. Therefore this glapsplot is a chunderoid. Since this syllogism is valid, if it be true that all skerfuffles are chunderoids, and if it be true that this glapsplot is a skerfuffle, then it is ineluctably true that this glapsplot is a chunderoid. But not necessarily if either or both of the premisses are false. All skerfuffles are chunderoids. This glapsplot is a chunderoid. Therefore this glapsplot is a skerfuffle. This syllogism is invalid because it is possible that not all chunderoids are skerfuffles. And yet the conclusion may be true. for it is possible, though not necessary, that this particular glapsplot is a chunderoid that also happens to be a skerfuffle. Bottom line: I shall continue to use the words “prediction” and “projection” as interchangeably as everyone else in the scientific world happily uses them, and without any unacceptable loss of rigor. For as long as the IPCC uses “predict” on the basis of its models’ output, so shall I, whether Mr Odberg likes it or not, for everyone else but he will understand exactly what I am saying. One appreciates that the ever-more-visible failure of the models’ predictions is a most inconvenient truth to the likes of Mr Oldberg. No doubt he conceives that trying to make everyone use the word “projection” when “prediction” would be clearer will to some degree soften the humiliating blow. But I, for one, will continue to write plain English, and Mr Oldberg will just have to put up with it. Observe, finally, that in all of this discussion Mr Oldberg has neither defined “prediction” nor defined “projection”, nor explained why – in the context in which the scientific community interchangeably uses both – they ought not to do so. Indeed, in his previous comment, he says, “IF” the definitions be different …”. There could be no clearer demonstration of the pointlessness of his wafflings than that. By asides such as “If Mr Oldberg knew anything about logic – and almost every time he mentions it he commits an error…” Monckton diverts the topic of the debate from the equivocation fallacy to me. His apparent purpose is to prevail in the minds of the members of our audience (if any) by portraying me as an incompetent on issues of logic who therefore cannot be believed. This is an example of an ad hominem argument. An ad hominem argument is the last refuge of a debater who is out of ammunition. Monckton is unable to defend his position through legitimate argument so defends it by fallacious argument. According to the author of Wikipedia’s article on “Proof by Assertion” the term references “an informal fallacy in which a proposition is repeatedly restated regardless of contradiction.” By “argument by assertion” I meant “proof by assertion.” I’m sorry for my mistake in terminology. In stating his “bottom line,” Monckton announces his intention to use the polysemic terms “prediction” and “projection” interchangably, thus making equivocations of his arguments. There is no offense provided that he refrains from drawing conclusions from these arguments. When he draws conclusions from them though, he is guilty of the equivocation fallacy. Mr Oldberg wriggles, but nonetheless retreats. He is a born quibbler, but there comes a time when even quibblers must give over. Let us review progress. He has abandoned his attempts to say that the models’ predictions do not concern statistical populations, for they self-evidently do. He has abandoned his erroneous statement that argument by assertion is fallacious. He now accepts that all logical argument proceeds by way of assertions, known as “propositions”. However, he now adds several further logical errors. Let us patiently deal with each in turn, so that the retreat towards wisdom on Mr Oldberg’s part may continue. He says an equivocation is an argument in which the conclusion does not follow from the premisses. No, it is a particular form of argument in which the conclusion does not follow from the premisses because a polysemic word is used in two distinct meanings, but the logical form of argument proceeds as though the meanings were the same. He says that the scientific community, which he personifies in me, is guilty of the fallacy of equivocation: but his ground for stating that we equivocate is that we are using two distinct terms interchangeably, so that sometimes we draw conclusions as to the models’ “predictions” and sometimes we draw conclusions as to the models’ “projections”. But, as I have already attempted to explain to him, the equivocation fallacy only arises in an argument where a single term is used in two sufficiently distinct meanings, not – repeat not – in an argument where two terms whose meanings sufficiently overlap are used interchangeably. All of this is elementary logic, which is why I have recommended that Mr Oldberg should study an elementary textbook before attempting to expatiate inexpertly and inaccurately on a subject upon which, on his showing to date, he knows very little indeed. And this is why I have asked Mr Oldberg to clarify why he thinks there is insufficient overlap between the words “prediction” and “projection” for the scientific community to use them interchangeably. He makes the elementary logical error of challenging the scientific community’s use of two terms without himself defining those terms and explaining why the manifestly large overlap between their meanings is irrelevant. In logic, a quibbler is one who draws petty and pointless distinctions. A vexatious quibbler is one who refuses to explain why he insists on petty and pointless distinctions. Mr Oldberg is a vexatious quibbler. Usually a university logic 101 course beats this tendency out of those who are small-minded enough to be prone to it. Next Mr Oldberg makes the mistake of citing Wikipedia as though it were an authority. In most universities, citations from Wikipedia are banned because it is the encyclopedia that any idiot can edit and that, therefore, only a cretin would credit – to quote an eminent professor on the subject. Mr Oldberg then says I must not draw conclusions from arguments. However, as I have already patiently tried to explain, an argument consists of one or more premises and a conclusion. If the premisses validly entail the conclusion, the argument is valid. If the premisses validly entail the conclusion and are all true, then the argument is sound and the conclusion is true. Mr Oldberg makes the fundamental logical error of asserting that the scientific community must not use the terms “prediction” and “projection” interchangeably, but without producing a single instance where I – who am for some reason the particular focus of his petulance – have perpetrated a specific fallacy by a particular argument. He makes the further fundamental logical error of asserting that I am logically wrong without having identified and specified the premisses and the conclusion of any specific argument that he conceives to be logically fallacious. Finally, he makes the fundamental logical error of dressing up his prejudice against the interchangeable use of the words “prediction” and “projection” as though it were a failure of logic on the part of the scientific community rather than a mere prejudice on his part. However, since I have at present the time to offer him an education in these matters, I shall continue to force him backward, step by step, towards an understanding of the truth. For these conversations are all archived, and his wilful persistence in ignorance and error is a paradigm of the misconduct of a certain politicized element in the scientific community that has done grave damage to science by its sullen refusal to adhere to the scientific method, and to logic. Finally, Mr Oldberg – a whiner by temperament – complains that I have used ad-hominem arguments. No, I have not. If he offends against logic in the manner I have described, then he is a quibbler by definition, so no ad-hom arises. However, his persistence in not using my full surname, Monckton of Brenchley, is indeed ad hominem. He has persisted in this solecism despite repeated requests that he desist. Accordingly, even if I were to lapse from logical rigor by resorting to ad-hominem arguments, Mr Oldberg is in no more position to complain about that than the pot is to call the kettle black. He is out of his league, and everyone knows it. My understanding is that your surname is “Monckton.” Thus, I am perplexed that you so dislike my use of the term “Mr. Monckton” as to bring it up in each of your posts. In American English, “Mr. Monckton” is a respectful and accurate form of address for a person who lacks a PhD. When you argue that “the models’ predictions do not concern statistical populations” you state an equivocation, for the term “prediction” is polysemic; thus, no conclusion may properly be drawn from your argument. Through a usage in which “prediction” is disambiguated, a similar argument may be constructed from which a conclusion may be properly drawn. Under disambiguation, a “prediction” is an extrapolation to the outcome of an event. The complete set of these events is an example of a statistical population. A “projection” is an issuance of a climate model and is a mathematical function that maps the time to the global temperature. While a “prediction” references a statistical population, a “projection” does not reference one. Thus, one important reason for distinguishing between a “projection” and a “projection” is to highlight the absence from every global warming model referenced by the IPCC of the statistical population that underlies it. To attempt to conduct scientific research in the absence of the statistical population underlying its models is a fatal blunder that is is obscured when “prediction” and “projection” are treated as synonyms. The second is that Mr Oldberg says one cannot use a word with more than one meaning in a logical argument. Actually, this is well-trodden territory: of course one can, as long as the meaning is clear from the context. The models predict, in quite some detail, how various climate variables will change, month by month, for 100 years. Those predictions constitute a statistical population. Or one can call them “projections”: for they, too, both reference and generate what Mr Oldberg pompously calls “statistical populations”, what mathematicians simply call “sets”, and what computer programmers call “datasets”. The terms “prediction” and “projection”, therefore, are interchangeable, without loss of comprehension, as everyone but Mr Oldberg understands full well. Mr Oldberg has been talking nonsense throughout, tinkering futilely with concepts in logic with which he is plainly unfamilar. However, his primary purpose, which is to derail threads such as this, has failed, and he has perforce learned something of the elements of logic from me in the process, though he has not yet begun to apply what he has learned. In future, he should not waste his admittedly not very valuable time making a fool of himself here. He should direct his tedious quibbles to the IPCC, which will continue to pay no more attention than I do to his pathetic, pseudo-academic drivel, and will continue to use “prediction” and “projection” interchangeably. Everyone except Mr Oldberg will understand perfectly what the IPCC means. Do you claim the existence of statistical populations underlying the IPCC climate models? If so, please provide a citation to them. A statistical population (in mathematics, a “set”) is defined as the total membership or population or universe of a defined class of people, things, or events (in mathematics, an “object”). The “target population” or “scope” (in mathematics the “chosen set”) is the population about which information is sought. The “survey population” or “coverage” (in mathematics the “operative subset”) is that fraction of the target population or chosen set on which the analysis (in mathematics the “operation”) will be performed. To take a simple example, one purpose of climate models is to represent the climate object in mathematical terms via a series of (usually thousands) of equations and then to examine both that object and its constituent objects to determine how those objects will evolve over time. Thus, for instance, from the set or population of all measurements of temperature a subset (consisting, say, of monthly global means from a particular data source over a defined period) is one of many statistical populations examined by the models, which then output a new set, or perhaps an interval of sets, of predicted monthly global means (such as that which will be found in Table 10.26 of AR4, for instance). This new set (or interval of sets), too, is a statistical population, on which various operations (such as determination of a trend) may be carried out. 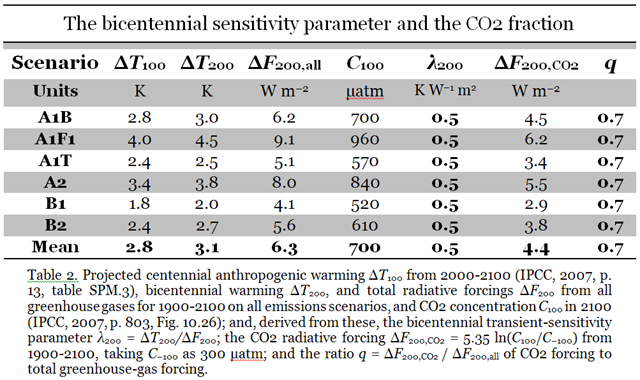 In Table 10.26, there are predicted intervals for global temperature, for CO2 concentration, for radiative forcing, etc., under six distinct “emissions scenarios). Each of the postage-stamp-sized graphs in Table 10.26 displays three statistical populations – the max, mid and min predictions. Now, the IPCC, on page 39 of its Second Assessment Report, says that a “projection” is one that does not favor any particular prediction within the interval of predictions made by the models. From this rather artificial distinction (to which the IPCC itself pays but intermittent subsequent lip-service), it follows that, wherever the IPCC selects a particular value as its best estimate, it is making what it calls a “prediction”, even if it is making that prediction on the basis of an interval of predictions that it calls a “projection”. In mathematics, the word “projection” has a more specific meaning – it is a “casting forward” or extension of a previously-established set, such as the points on a given straight line. Accordingly, mathematicians, who are particularly precise in their definition of terms, will not be comfortable calling an interval of predictions a “projection”. We will tend to call predictions “predictions”, whether they are single numbers or an interval. However, little loss of rigor occurs where the scientific community sometimes refers to a specific prediction as a “projection”, for it is no longer using the word in its mathematical, rigorous sense: instead, it is merely using the part for the whole, in a context that admits of little or no loss of comprehension. Thank you for responding to my request. I’m pleased to see our discussion get down to a purely technical level. If it remains at this level, I think we can resolve the issue in short order. You say “Thus, for instance, from the set or population of all measurements of temperature a subset (consisting, say, of monthly global means from a particular data source over a defined period) is one of many statistical populations examined by the models, which then output a new set, or perhaps an interval of sets, of predicted monthly global means (such as that which will be found in Table 10.26 of AR4, for instance)” The syntax of this sentence is incorrect. It sounds as though you mean to contend that an event in the population is a temperature or average temperature (e.g., a monthly average). There are some problems with this contention. A “prediction” is an extrapolation from an observed state of nature to an unobserved but observable state. The former state is called the “condition.” The latter state is called the “outcome.” Your event has no condition while its outcome is a temperature or average temperature. As an average temperature is a less problematic choice of outcome than a temperature, let’s assume that the outcomes are average temperatures. A global temperature time series provides a source of temperature values and from these values an average may be formed over a specified time period. The predicted value is a real number. The observed value is a real number. The probability that the two values will coincide is nil. Thus, with the outcome defined in this way, the model is sure to be falsified. To avoid falsification of his or her model, the builder of this model must define the outcomes more broadly. One possibility is to divide the temperature values into intervals such that the complete set of intervals is a partition of the complete set of values. This could produce, for example, an outcome in which the value of the average temperature lies between 15 and 16 Celsius in a specified time interval. Your idea of associating the outcomes of events with time averages of global temperatures is consistent with the traditions of climatology. Traditionally, the average is taken over 30 years. For statistical independence of the events, the periods of the events cannot overlap. This consideration reveals an inherent limitation of global warming climatology: going back to the beginnings of the various global temperature time series in 1850, there are between 5 and 6 events of 30 year duration. Experience with model building by methods that are maximally efficient in their use of information suggests that the minimum number of events for construction of a statistically validated model is about 150. Thus, global warming climatology is short on events of 30 year duration by a factor of around 30. Reduction of the duration of an event to 1 year would produce 163 independent observed events giving climatologists a chance at producing statistically validated models. The word “climate” would have to be redefined and it is unclear whether a basis would then exist for public policy decisions on CO2 emissions. * the description of each outcome. While this state of affairs remains, the statistical population underlying each climate model will remain an empty set. Under this circumstance, it is impossible for a climate model to be statistically validated. Also, it is impossible for such a model to provide information to a policy maker about the outcomes from his or her policy decisions. Policy makers must think they have information but they have none. That they think they have information is a consequence from applications of the equivocation fallacy on the part of climatologists. Long ago, Vincent Gray spotted the impossibility of validating one of the models. In his paper “Spinning the Climate,” Vincent reports complaining to IPCC management that past assessment reports claimed the models to be validated when they were insusceptible to being validated. IPCC management reacted by changing the word “validated” to the word “evaluated” in subsequent assessment reports. An “evaluation” is what one sees in AR4 and AR5. It remains impossible to validate a model. This sorry state of affairs is obscured by applications of the equivocation fallacy, features of which are: a) confusion of “evaluation” with “validation,” b) confusion of “projection” with “prediction” and c) confusion of “pseudo-science” with “science.” The power of this fallacy to yield logically illegitimate conclusions is broken through a disambiguation in which “projection” takes on a different meaning than “prediction,” “evaluation” takes on a different meaning than “validation” and “pseudo-science” takes on a different meaning than “science.” As currently structured, global warming climatology is a pseudo-science.